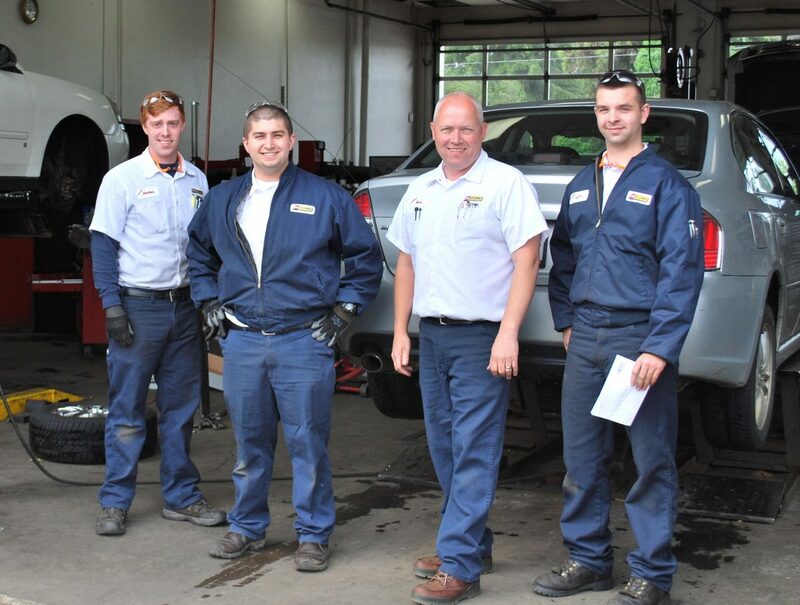 The team at Centralia Les Schwab makes sure your tires, brakes and other car repairs are all in working order. A community is greater than the sum of its parts. This is true around the country, and right here at home in Lewis County. Local business, community partners and individuals all work together to support area youth, schools and non-profits making us all better. Les Schwab’s Centralia and Chehalis stores are part of that local equation, giving substantial support to groups around the area, creating success for everyone. Centralia store manager Mark Witham has been leading the Les Schwab team on Harrison Avenue for over ten years. In that time, he’s seen how local giving and sponsorships are an integral part of the Les Schwab philosophy. Tony Lyons has been at the helm of the Chehalis store less than a year, but has noted the tremendous partnerships throughout Lewis County that Les Schwab has forged during decades of community service. Les Schwab’s Lewis County community support takes many forms. While often it involves a financial contribution, support also includes use of their parking lots for car washes, employee volunteers and product support at local events and sponsorship of students and athletes. Donating the use of their parking lot on Harrison for charity car washes is the norm for the Centralia Les Schwab store. Photo courtesy: Centralia Les Schwab. On any given Sunday, when the store is closed, you’ll find the parking lot packed with local sports teams, church groups, 4-H clubs or local non-profit groups. “We love letting the kids use the lot for their fundraising car washes,” shares Witham. The busy, central locations of both stores—Centralia’s on the main drag of Harrison near the outlet malls and Chehalis’s store on Main near downtown—ensure plenty of traffic to make the fundraisers a success. And, by partnering with the City of Centralia, each group is provided a “green” car washing kit to ensure the events keep our waterways clean. Local sports teams have partnered with Les Schwab for years. The Centralia Little League and Les Schwab have a long history, including the company’s support in rehabilitating facilities and sponsoring tournaments. Local high schools work with the company for team sponsorships and creative fundraising. “In the past, we’ve sponsored $1 per point scored at home basketball games for Centralia High School, which is a lot of fun for the team and spectators alike,” Witham shares. Twin City Youth Football, Centralia Girls Softball Association and W.F. West High School athletics are among the other sports groups supported by the local Les Schwab stores. Company-wide, Les Schwab is a strong supporter of local 4-H and FFA (Future Farmers of America) organizations. Founder Les Schwab himself was a cattleman and the company still reflects not only his work ethic, but his commitment to the art of animal husbandry. Locally, both Lewis County Les Schwab stores support the Southwest Washington Fair 4-H and FFA Junior Livestock Auction. This annual event is where youth can showcase the hard work they’ve done to raise an animal from birth. 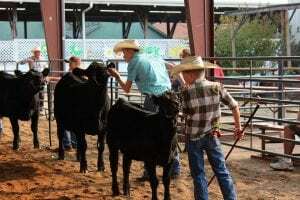 “It’s almost a tradition in the company and something Les used to do, to attend the livestock auctions and help the kids get a great price for their animal by helping the bidding,” Witham shares. Beyond the financial support, Witham shares how the fundamentals taught by these groups match the Les Schwab philosophy of hard works, follow through and dedication. Ultimately, supporting these local kids can lead to future employees with the work ethic to rise through the ranks in a Les Schwab career. Each year, Lewis County Les Schwab stores are major sponsors of the Western Washington Classic livestock auction for FFA and 4-H kids at the Southwest Washington Fair. Photo courtesy: Western Washington Classic. In Centralia, Les Schwab is an important presence at the annual Hub City Car Show. Held each August in downtown Centralia, Hub City is the place to be for car buffs throughout the county. Les Schwab is there each year with their 45-foot trailer and custom wheel displays. Employees are on-site during the entire show to answer questions, chat up the cool cars and offer assistance when needed. Witham works closely with the Centralia-Chehalis Chamber of Commerce to ensure Les Schwab is helping make the Hub City Car show the best experience it can be for visitors. Nationally, Les Schwab is widely known for its annual toy and food drive during the holidays. Witham shares that both locations bring in a significant number of donations and everything is funneled directly back into the hands of kids throughout Lewis County. Add to this extensive list their ongoing support of the Rocky Mountain Elk Foundation, annual saddle sponsorship at the Washington State High School Rodeo Association, support of the Coastal Conservation Association, the Toledo Cheese Days Car and Motorcycle show and the list goes on. Although backed by a national brand, the Lewis County Les Schwab teams are a local business at their core giving of their time, funds and hearts generously to support their neighbors all year long.